Most people, when they think about severe burns, automatically imagine fire as the main cause of these devastating, life-changing and sometimes fatal injuries. Fire is more dangerous that hot water in many ways – hot water doesn’t stay hot, it doesn’t spread to clothes and other fabrics and materials in the same way as fire does. Once hot water has made contact with skin, it starts to cool almost immediately. However, hot water and liquid vapours can still be very dangerous and they present a particular danger to babies and young children in and around the home. Burns from hot liquids or vapours are known as scalds and, in the home, they can happen in a matter of seconds but have lifelong implications. This is why you need to know about preventing them and, if an accident does happen, what to do to treat them rapidly and to lessen the severity. The main cause of scald injuries in the home are hot drinks, particularly tea and coffee. If you tend to drink black coffee or herbal teas, then you don’t add cold milk to bring the temperature down a few degrees, so these are especially risky to have around small children. A scalding injury is often more dangerous to a baby or a child than an adult simply because if, for example, 200ml of boiling water falls onto your leg, it’ll scald only a relatively small area of your skin. If the same amount falls onto a baby’s leg, not only will it cover a larger proportion of the baby’s skin area, but a baby’s skin is also thinner than an adult’s. This means that damage to the lower layers of skin happens much faster and is more devastating. As you can imagine, children are most likely to be scalded at home, particularly in the kitchen, although accidents with hot water also happen in bathrooms, especially if there’s no mixer tap or tempering valve. 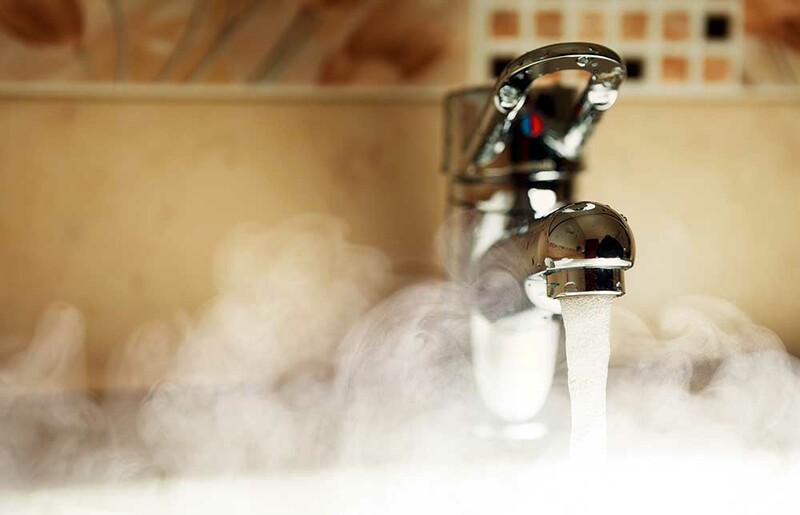 Tempering valves use a sensor to monitor the temperature of the hot water being drawn and automatically add enough cold water to reach a maximum of 50C for domestic hygiene outlets. If you’re having a tempering valve or another water safety device fitted then you should always use a licensed plumber. You can also install child-resistant taps so that your children can’t operate the taps themselves, but these don’t control or reduce the temperature of the water. Hot drinks are the most common cause of scalding injuries to children as younger children can knock or pull cups onto themselves when cruising coffee past tables. They can also pull on tablecloths when moving around, causing cups or jugs to fall on them. It’s best to avoid the use of tablecloths if you have young children, as they may also be injured by pulling knives or heavy plates onto themselves, too. Another cause of drink-related scalds is when babies or children pull or knock a hot drink out of an adult’s hand when sitting on their knee. If you’re nursing or you have a particularly clingy baby then you may have to forgo your cup of hot coffee for a while and drink iced coffee or tea or stick to water. Scalds from hot cooking oils are very nasty as the oils are typically much hotter than even boiling water and the oil tends to stick to the skin and clothes more. Younger children should really stay away from the cooking areas in the house until they’re old enough to be suitably wary of hazards. Instant noodles are becoming a common cause of scald injuries, with the liquid – and the noodles themselves – falling from the cup or pot. The water might no longer be boiling, but anything above 65C is enough to cause a serious burn in a couple of seconds. When children are older and learning to cook for themselves, they may burn themselves by taking food out of a microwave or removing a pan from the hob. It’s vital that they know to run the burned area under a cool tap immediately – even before calling you for help. A common cause of scalds outside of the kitchen is the hot tap in the bathroom. Children can jump into a bath that’s too hot or they may turn on the hot tap while they’re in the bath or at the sink. It’s not just boiling or very hot water that can cause serious burns. Some domestic hot water is dangerously hot. It takes less than a second for water at 65C to cause a deep burn, while at 60C it takes five seconds. It’s 30 seconds for 55C to cause serious burns and water at 50C takes five minutes. If you’re worried about the water coming out of your taps – even mixer taps can release excessively hot water if they’re turned too far – then you need a reliable tempering valve from a supplier like Australian Hot Water. How many scalding injuries are there in Australia? Between 2005 and 2013, there were 5,448 burns involving children aged 0-4 in New South Wales alone. More than half (57%) of these injuries happened in the kitchen and were mostly caused by hot soups, noodles, tea or coffee. Is there an Australian Standard for hot water delivery systems? Yes, there is – AS 3500.4 -1994 & AS/NZS 3500.4.2:1997, in fact. This law in Australia says that newly-installed hot water systems that deliver water to outlets designated primarily for domestic personal hygiene utilities or purposes must be set to no higher to 50C. These utilities include baths, basins, sinks and showers. While older homes might not have a tempering device installed, it’s quite easy to have one retrofitted to a bathroom or kitchen by a reputable plumber. In 2012, New South Wales adopted the Plumbing Code of Australia (PCA) and this code states that a temperature-control device – like a tempering valve – must be installed when a water heater is installed. It doesn’t matter if the heater is entirely new or a replacement, it must feature this device. You should never leave young children alone in the bathroom or the kitchen, or with another young child. This is doubly important if they’re in the bath together. If you’re running a bath for your children, then either ignore your phone or turn on the answering machine so that you’re not distracted while your children are in the bath. If you have very young children then keep the bathroom door closed until you need to enter the room. A really good tip for running a bath for young children is to run cold water first. In this way, even if someone manages to climb in before they’re supposed to, the water will either be cold enough to provoke a sharp exit or it’ll be lukewarm or thereabouts. This is also a good idea for running showers, too. Even with these measures, you should always check the temperature of a bath before putting young children in it. Using your elbow, or a floating bath thermometer, is a great way to gauge temperature – the maximum safe temperature for smaller children is 40C. Only use the back rings to cook on, especially if you’re simmering a stew for a while and you may have to leave the kitchen. Make sure you turn pan handles so that they’re out of reach to young children and can’t be accidentally knocked by anyone passing by. Install a safety gate to keep your children out of the kitchen – you can still talk to them, but they can’t get under your feet. Always make sure that your kettle, toaster, slow cooker and other appliances are pushed to the back of the work bench so they’re out of reach of small children. Only boil as much water in your kettle as you need at the time and discard any unused hot water if you do overfill it. Use a cordless kettle or one with a coiled wire so that it’s harder to pull the kettle off the bench. Never pour water on burning oil as this can lead to burning oil spattering into the air and onto any nearby surfaces – including nearby people. Move away from the fire and dampen a cloth large enough to cover the burning area, then place the cloth over the flames. If this doesn’t work, leave the house and call the emergency services. If you’re eating hot soup, stew or noodles, then make sure that children eat at a table rather than on their laps so that any spillage goes on the table rather than on their bodies. If possible, drain hot broth from noodles before serving, or, if the broth is an important part, leave it to cool for several minutes. Don’t heat up baby formula in bottles in the microwave; this can create hotspots that can burn the baby’s mouth. Don’t heat up food for longer than the instructions say as over-heated foods and sauces can explode once opened or removed from the microwave. Using full power isn’t always the best way to go – try microwaving on half power and stop and stir regularly. If older children are starting to use the microwave to heat up food or drinks, then make sure it’s placed no higher than their waist height so that they’re not reaching upwards to get their food out. Don’t try to hold a young child and a hot drink at the same time – small children and babies just love to grab and wriggle. Keep hot drinks well out of the reach of younger children and don’t use tablecloths as these are often pulled on by toddlers, which can bring down cups or jugs containing hot liquids. Run the burned area under a cool tap for at least 20 minutes – don’t use high-pressured water on a burn as it can cause more damage. The idea is to transfer the energy of the hot liquid or object into the water so all that’s needed is a steady supply of cool water. If there’s no running water, then a cold can or bottle held against the burn is better than nothing. The actual process of a burn takes longer than you’d imagine, with the residual heat from the burn causing damage to the lower skin layers for up to three hours after the event, so keep that cool water running. If the burn is more than two or three centimetres in diameter then seek medical advice. You should also call 000 if you’re not sure you’re doing the right thing or if you’re worried. Never use butter or oil on a burn as these oils effectively seal the heat into the burned tissue, making things much worse. Similarly, cream and toothpaste should be avoided, too. It’s tempting to use an ice cube or iced water, but this is another extreme of temperature and so can cause tissue damage. Avoid the use of burn creams for at least three hours – they don’t transfer the heat from the burn and so they’re no substitute for cool water. Australian Hot Water have been servicing, installing and repairing hot water systems all over Sydney. We take hot water safety very seriously and all of our work is done with both children’s and adults safety in mind.